Meriden Grange, located at 540 Broad Street in Meriden is gearing up for its 89th annual Meriden Grange Fair on Saturday, September 8th, 2018. This is a local fair open to the public. Admission to the Fair is free. 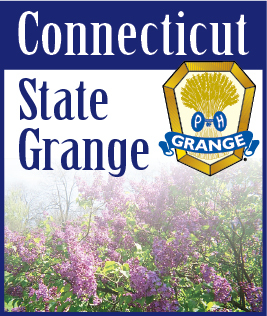 We are asking the public to help support the Meriden Grange Fair by entering in this year's contests. The following contests will be open for entry: Assoc. of CT Fairs Contests (Adult & Junior Baking, Apple Pie, & Quilt), Needlework, Flower Show, Home Bakery, Canned Fruits and Vegetables, Fruits and Vegetables, Adult and Children Arts and Crafts, and Photography. Entries will be accepted from 5 to 8 PM on the evening of September 7th. Our entertainment this year is “The Bob Charbonneau Show” from Grange Radio at 3:00 PM. This will be an hour long show with music and skits for the folks attending our fair. Grange Radio is sponsored by the National Grange Foundation – more info. about Grange Radio show times can be found on https://www.facebook.com/grangeradio . This is a streaming audio station on the internet and can be reached at, http://www.GrangeRadio.org . The Fair also features a Family-Style Meat Loaf Dinner. The dinner will be served from 5:00 PM to 6:00 PM, and offers Mashed Potatoes, Gravy, Cindy’s famous Cole Slaw, Vegetables, Bread with Butter, Dessert, and a Beverage. Take-outs will be available. For reservations please call (203) 237-4617. The cost for Adults is $12, Children 12 and under $6.00. Organizers stress that the dinner often sells out quickly, so reservations as strongly recommended. Meriden Grange Fair is affiliated with the Association of Connecticut Fairs. The Adult and Junior Baking, Apple Pie and Quilt contest winners, from the Meriden Grange Fair, will have a chance at winning at the State run-offs scheduled in November. All contest entries will be accepted between 5:00 PM and 9:00 PM on Friday, September 4th. The day's activities also include: community service exhibits, exhibit of all entries, plus a vegetable auction and raffle at 6:30 PM. Further information about the fair is available by contacting Meriden Grange at (203) 237-4617, e-mailing info@meridengrange.org or by visiting http://www.MeridenGrange.org.